Spurs can be traced back to the Roman Legions of Julius Caesar . The Romans developed the spurs in order to have a way to steer their horses with their legs, while leaving their hands free to fight. These early spurs had a single sharp protrusion. The revolving rowel, used in western spurs today, probably originated in France. During the age of chivalry, spurs became a mark of rank. Gold or gilded spurs were only worn by knights or royalty. To further indicate their rank and prestige the knights would adorn their spurs with jewels, thus becoming works of art. In the 15th century, horse armor, called “bards” played an important role in influencing spur design. The armor had a section called the "flanchard" which protected the horse's flanks. In order for the spur to reach the horse, an extremely long shank was developed, up to a foot in length. By the 16th century, the bards popularity became rare and the spur lengths returned to normal. In Spain, armorers developed large and ornately decorated spurs with rowels. Spur designs in Spain and colonial Mexico were particularly elaborate. For example, the spurs of the Spanish Conquistadors were sometimes called Espuela Grande, the "Grand Spur," and could have rowels as large as six inches around. The conquistadors went to the new world with these ornate designs. Their influence can still be seen today in Mexico and South America. The spur became, and still is, an integral part of the vaquero and cowboy traditions. Spur styles also changed in the United States. In colonial days, the English style was popular. This style of spur was light and conservative, with a slight curve and small rowel. In 1882, the Calvary wore solid brass spurs that were slightly curved, with a small rowel, black straps, and a brass buckle. After the Civil War, the Calvary used a straight shank and eliminated the rowel. In Western Riding, spurs are not only used as a tool but seen as an art form. Spur designs include handmade engravings, silver and other precious metals. 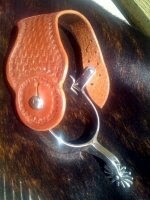 The Old West style spur straps are again very popular! The old Dove Wing shape spur straps, pictured above, without buckles are a very simple design and less expensive than more ornate ones. Once you put them on your spurs, you can leave them attached and just slide off and on the top of your boots. The old west designs are coming back in style and have beautiful stampings, tooling and hand carvings. They are available with hand engraved silver, brass and bright bling. The wider shapes and designs have a more comfortable feel across the top of your foot and you can be personalized very easily with conchos and buckle sets. Buckaroo Leather has a wide variety of spur straps to suit every need!